Come spring, vegan toddlers will have even more eco-friendly shoe options to hop, skip, and jump in. 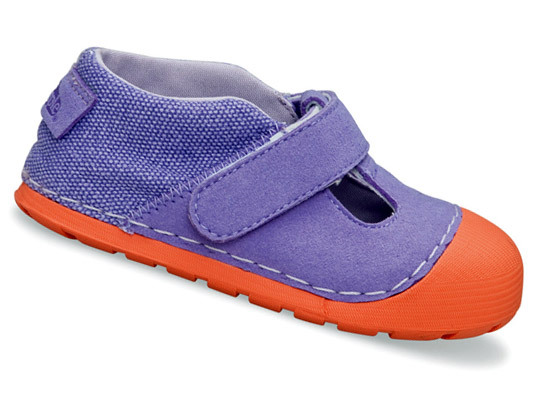 Simple Shoes has just unveiled its new product line for Spring 2011, including its first cruelty-free toddler shoes for the season. Girls can choose between the Doogie, a star-print Mary Jane in organic cotton and recycled PET (made from used plastic bottles), and the Poodle, a T-strap shoe that features synthetic nubuck uppers. Boys shouldn’t feel left out, however. The company is bringing back its popular Doodle style in a herringbone-patterned blend of organic cotton and linen. All of the shoes, which are expected to retail for $35 a pair, are fully washable and non-marking. We bought these at Ross. Although I am pleased they are vegan, they do break skin at the heel if worn without socks.